It was in the year 1793 that Captain James Colnett of the Royal Navy set sail in the merchant ship Rattler to do a survey of the Galapagos Islands to investigate the possibilities of sperm-whale fisheries in the region. 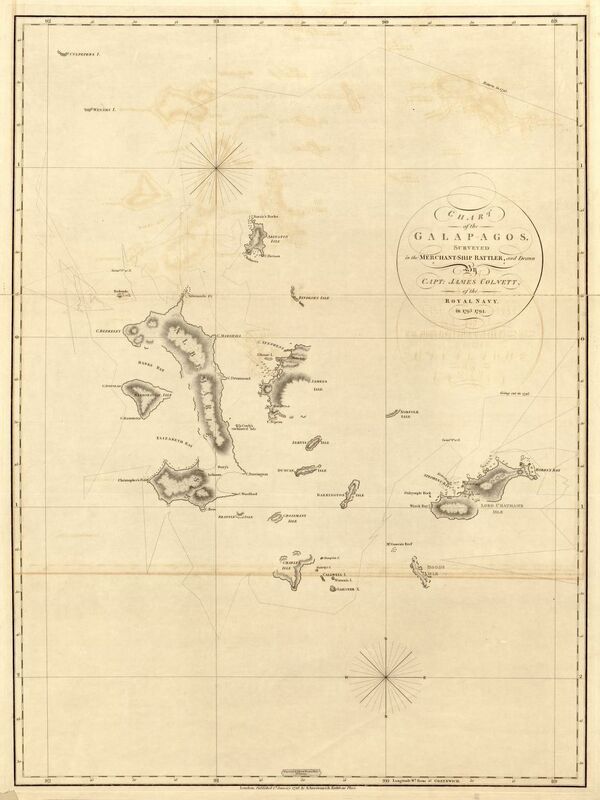 Colnett’s Chart of the Galapagos is the first fairly accurate map of the archipelago. 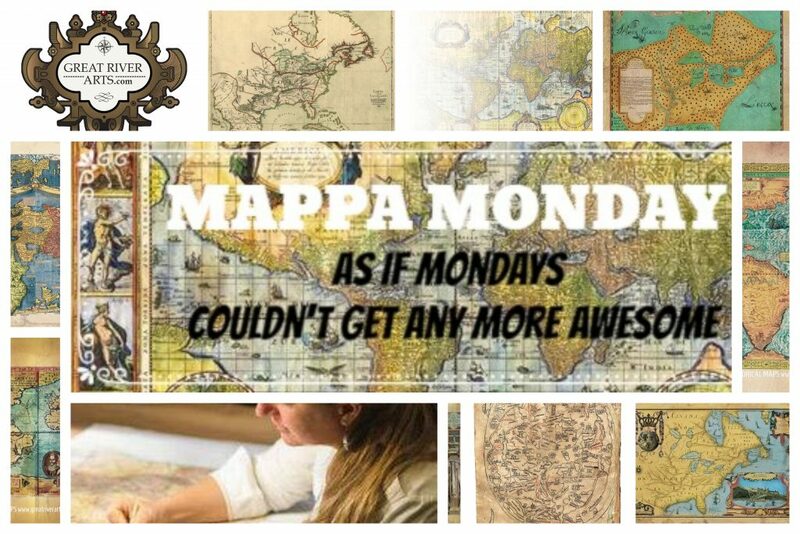 It was published on January 1, 1798 by notable London map-maker Aaron Arrowsmith, who surveyed the Great Post Roads between London and Falmouth, and in the 1790s, established his own map-making business, publishing roughly 200 maps. Colnett is known for serving under Captain James Cook during Cook’s second voyage of exploration, from 1772 to 1775. He led two private trading expeditions to the Pacific Northwest of North America that he chronicled in his book published in 1798, A Voyage to the South Atlantic and Round Cape Horn into the Pacific Ocean. This map of the Galapagos Islands traces the route of Colnett’s Rattler, and was important to expanding the whaling industry, by charting suitable places for the establishment of ports, bays, harbours and for British merchant ships to anchor. Colnett’s two visits to the Galapagos Islands convinced him that the archipelago was as a suitable Pacific base for whalers. He named several of the Galapagos Islands, including San Cristobal (Chatham), Espanola (Hood), Santa Fe (Barrington) and Rabida (Jervis). Of the islands, Colnett contended that Florena Island was ideal for ships to anchor, shelter, adequate water supply and an abundant source of seafood. On the map, the islands are labeled using their original names, with the largest island, Isabela as Albemarle after the Duke of Albemarle. What do we know about the Galapagos Islands today? The archipelago has been known by several names, including the “Enchanted Islands.” It is comprised of roughly 19 islands and several smaller islets, stretching for 620 miles off the Ecuadorian Coast. The Galapagos Archipelago a World Heritage site, whose land and sea are protected. Inhabiting the archipelago and its surrounding waters are roughly 9,000 endemic species of animals and plants. It is recognized for its unique wildlife, such as fur sea lions, gigantic sea tortoises, flightless cormorants, finches, marine iguanas and a variety of subspecies of mockingbirds. The giant daisy trees Scalesia and large cacti are two examples of the Galapagos’ endemic plant life. The Galapagos Islands’ incredible animal species served as the inspiration for Charles Darwin’s Theory of Evolution, following his visit to the islands in 1835. The mystique of the Galapagos Islands continue to captivate many today.